In 2006, Nature tried an experiment. The journal receives about 10,000 manuscripts a year and sends 40% of them out for traditional peer review. In the trial, the editors asked authors if they would also submit their paper for open peer review where any scientists could leave signed comments. 71 authors agreed. The journal promoted the experiment heavily on their website, through e-mail blasts, and with targeted invitations to scholars in the field. After four months, they reviewed the results. Despite sizable web traffic to the site, 33 papers received no comments, and the most heavily commented on paper received only 10 replies. 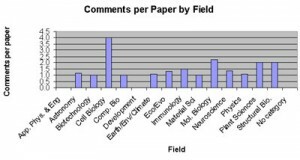 Nor did the editors find the comments influential in their decisions whether to publish. They found that although many scientists approved of the idea of open review, very few would perform it. Their experiment demonstrates both the promise and the pitfalls of social media. It opens up the possibility for dialogue, but it depends on self-motivated users to enrich the content. This entry was posted on Monday, November 14th, 2011 at 11:09 am	and is filed under Faculty development. You can follow any responses to this entry through the RSS 2.0 feed. Both comments and pings are currently closed. thanks for visiting my blog, keep posting, keep adding value. This is a nice post. I´ve encountered this post several times this week searching for something alike. Now is in my news box Keep up the great work! What is sizable web traffic? Is it 100 visitors to those papers, or thousands per day? Also, did the traffic spread evenly or concentrated mainly on certain pages? People comment on what they see. If they don’t see certain pages, they just won’t comment. Perhaps you would be interested in the project coming up, Day in the Life of Digital Humanities. We have about 100 participants around the world who will blog a day’s worth of activities they do as digital humanists. The group have already posted answers to the question, How do you define Humanities Computing? I think what you composed was actually very logical. However, what about this? suppose you were to create a killer headline? I am not saying your content is not good, but suppose you added a title to maybe get a person’s attention? I mean Pitfalls of Peer Rerview Faculty Development and Diversity is kinda boring. You should peek at Yahoo’s front page and watch how they create article titles to grab people interested. You might add a video or a picture or two to grab readers interested about everything’ve written. In my opinion, it might make your posts a little bit more interesting. Very interestingtopic. In addition- I was searching on your www RSS feed or email subscription. Have You got any? I have learn a few good stuff here. Definitely price bookmarking for revisiting. I wonder how so much attempt you place to make this type of fantastic informative web site. Good day. Very cool web site!! Man .. Excellent .. Amazing .. I will bookmark your website and take the feeds additionally…I’m satisfied to locate so much helpful information here within the post. Thank you for sharing.. I am not real excellent with English but I get hold this really leisurely to read. so what can I really do? What can I believe that? Some guidelines would be drastically appreciated.